David Miami handled the creative for the initiative. In January, Burger King educated consumers on net neutrality. Now, the fast-food chain has decided to raise awareness about the country’s unfair "Pink Tax," which charges women additional costs for nearly identical products. According to the New York City Department of Consumer Affairs, the female version of products cost more than male versions 42 percent of the time. To bring this to light, Burger King decided to sell its regular Chicken Fries (normally $1.69) for a higher cost for "chicks" for one day. The chain even made a custom pink box. The reactions of female customers, who did not know why they were being charged more for their Chicken Fries that day, were filmed – and, unsurprisingly, they were not pleased with the price increase. As of today, Burger King will sell a custom pink Chick Fries box in select Miami, New York, Los Angeles, San Francisco and Chicago locations for the same price as the regular Chicken Fries. "Burger King restaurants welcome everyone, and we see Pink Tax as extremely unfair," said Renato Rossi, head of marketing for North America at the company, in a statement. 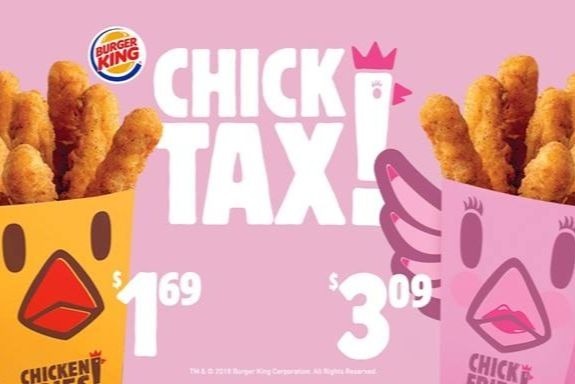 "We created this experiment with fan-favorite Chicken Fries to demonstrate the effect of Pink Tax and how everyone should pay the same for the same products – whether it’s pink or not." Girl Talk HQ, a women empowerment media outlet, launched a very similar stunt in Canada in 2016 to raise awareness of the Pink Tax. The group raised coffee prices for women at a Toronto cafe and filmed customers' reactions.